With C1, CO 20 sts on either dpns or a circular needle. Finished R1 looks something like the picture below. Remember not to turn the piece. 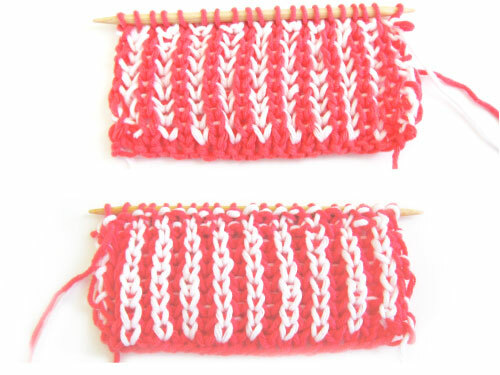 Rather, you will pick up the C1 yarn on the right hand side to begin purling in R2. You’re now going to purl into stitches that look like knits (see R3 below for detailed view of P1B). When you’re done with R2, it will look like the picture below (prior to turning).